A permit is required for all vessels (motorized and non-motorized including float tubes) and must be obtained in person at any of the following locations: South Entrance, Lewis Lake Campground, Grant Village Backcountry Office, and Bridge Bay Ranger Station. 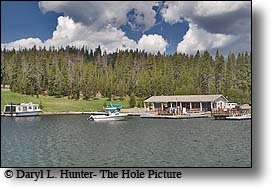 Non-motorized boating permits are available at West Entrance, Northeast Entrance, Mammoth Backcountry Office, Old Faithful Backcountry Office, Canyon Backcountry Office, Bechler Ranger Station, West Contact Station, West Yellowstone Chamber of Commerce and locations where motorized permits are sold. 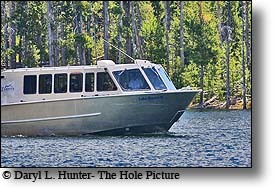 The fee is $20 (annual) or $10 (7 day) for motorized vessels and $10 (annual) or $5 (7 day) for non-motorized vessels. A Coast Guard approved wearable personal flotation device is required for each person boating. Boat permits issued in Grand Teton National Park are honored in Yellowstone, but owners must register their vessel in Yellowstone and obtain a no-charge Yellowstone validation sticker from a permit issuing station. 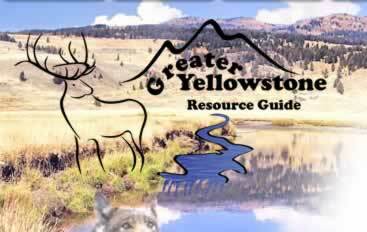 Jet skis, personal watercraft, airboats, submersibles, and similar vessels are prohibited in Yellowstone National Park. All vessels are prohibited on park rivers and streams except the channel between Lewis and Shoshone Lakes, where only hand-propelled vessels are permitted. 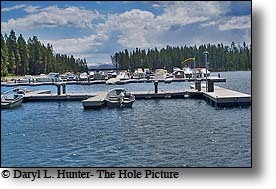 Outboards and rowboats may be rented (first come, first served) from Xanterra Parks & Resorts at Bridge Bay Marina on Yellowstone Lake. Xanterra also provides guided fishing boats which may be reserved in advance by calling (307) 344-7311 or 1-866-GEYSERLAND (439-7375). Other commercial businesses are permitted to offer guided services for canoeing, kayaking, and motorized boating. Bridge Bay Marina Located in a bay of Yellowstone Lake, the marina has everything you are looking for to outfit your water exploration. You can rent row boats, outboards, inboards and even dock slips for your own vessel. Bridge Bay Marina also has guides that can custom fit a trip to your interests. Whether you are wanting to explore the natural beauty of Yellowstone Lake or try your hand at fishing, Bridge Bay Marina is a great place to start.